In 1948, Porsche took its first race victory, a hill climb event just weeks after that original car was delivered to its owner. The small, agile Porsche 356 first built in Gmünd, Austria and later Stuttgart, Germany set the foundation for an enduring automotive company that has held true to its motorsport DNA since. Now, 70 years later almost to the day of that first hill climb title, Porsche comes full circle by debuting its first one-make class at North America’s premier time trial event: The 96th running of the Broadmoor Pikes Peak International Hill Climb (PPIHC). Scheduled to begin official runs up the 12.42-mile, 156-turn Pikes Peak on Sunday, June 24, the Porsche Cayman GT4 Clubsport Pikes Peak Hill Climb Trophy by Yokohama is an officially sanctioned and Porsche Motorsport North America (PMNA) supported class. Eight “invitation-only” entries will contest for the class trophy. The eight drivers and teams are familiar names to Porsche racing fans but only two have ever raced “up the Mountain” before. The lack of experience will magnify the task of eight-time Pikes Peak class champion Jeff Zwart (Corona de Mar, California). Zwart, whose titles in the “Race for the Clouds” have all come in variants of the Porsche 911, has set aside his effort for a ninth victory this year to act as coach and official liaison for the Porsche Cayman GT4 Clubsport Pikes Peak Hill Climb Trophy by Yokohama class. Three-time AMA Motocross and Supercross Champion, X-Game winner and stunt performer Travis Pastrana, driving the No. 199 Porsche Colorado Springs-entry, is one of the two aces with previous starts in the Colorado classic. The Davidsonville, Maryland-resident, who transitioned from two-wheel to four-wheel competition highlighted by stints in NASCAR and Global RallyCross, may be the most experienced hill climber in the crop with two past starts at Pikes Peak – including a Rally Group X win in his rookie race – as well as a record-setting run in the 2017 Mount Washington Hill Climb but his competitors are more familiar with the 385-horsepower machine. Mike Skeen (Charlotte, North Carolina) has also driven at Pikes Peak and has experience wheeling the Cayman GT4 Clubsport. Skeen, who is a regular Porsche driver in IMSA sports car competition, will be behind the wheel of the No. 21 prepared by CRP Racing. CJ Wilson (Fresno, California) – principal of Porsche Fresno – will make his Pikes Peak debut in the No. 982 being prepared by Rearden Racing team. Also out of the Rearden stable will be IMSA regular Till Bechtolsheimer of New York City in the No. 422. The trio of gentleman drivers in the Porsche Motorsport-built mid-engine sports cars up to the 14,115-foot finish line will be Dr. Alexander Marmureanu (Los Angles, California) in the No. 10 entered by Rearden Racing, Nicholas Kwan (Canada) at the wheel of the No. 420 being prepared by his own team, JF Racing of Area 27, and Canadian Tom Collingwood in the No. 69 also being readied by Kwan’s JF Racing program. IndyCar Series regular and 2011 Indianapolis 500-runnerup JR Hildebrand wraps the group of drivers invited to take part in the class. A late entry to the lineup, the Boulder Colorado-resident brings a wealth of motorsports experience but little in the way of rallying. He will share the Porsche Colorado Springs tent with Pastrana in the No. 66 Cayman GT4 Clubsport. PMNA will have race support on site for the entire week of practice and qualifying (June 19 – 22) and the race (June 24, 8:00 a.m. – 6:00 p.m. MDT / 10:00 a.m. – 8:00 p.m. EDT). Yokohama and Mobil 1 will provide technical support throughout the week dedicated to the class while Porsche Design will partner for the race with all eight Cayman GT4 Clubsport race cars. The Porsche Cayman GT4 Clubsport is the race variant of the popular road-going Cayman GT4. Sharing over 80 percent of its components with the street car, the mid-mounted flat-six-powered machine debuted in 2016 winning its first North American championship, the IMSA Continental Tire Sports Car Challenge (CTSCC) GS class, with Bodymotion Racing. 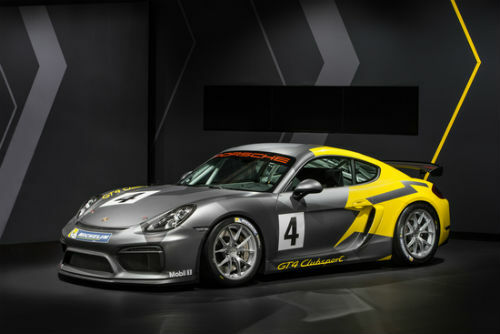 In 2017, the car was homologated into official GT4-specification and, with the required updates as well as performance modifications, took on the moniker of Cayman GT4 Clubsport MR. Soon after, it won a second GS class title in CTSCC with RS1. In addition, the car took victories in the Pirelli World Challenge GTS class with Flying Lizard Motorsports. RS1 returned to victory lane at the IMSA season-opening four-hour race at Daytona International Speedway winning overall with Spencer Pumpelly and 2017 class drivers champion Dillon Machavern. The Porsche Motorsport-produced car also competes in one-make class in Porsche Pirelli GT3 Cup Trophy USA sanctioned events. Dr. Daniel Armbruster, president/CEO, Porsche Motorsport North America. Jeff Zwart, Porsche Motorsport Consultant, Eight-Time Pikes Peak Class Winner. Travis Pastrana, Driver, No. 199 Porsche Colorado Springs Porsche Cayman GT4 Clubsport. While the Porsche Cayman GT4 Clubsport Pikes Peak Hill Climb Trophy by Yokohama is making its debut at the Broadmoor Pikes Peak International Hill Climb (PPIHC), the eight cars entered in the class are far from the only products produced by the German marque making a run up to the 14,115 ft finish line on June 24. Eight additional cars with a wide range of Porsche platforms are on the entry list for the 96th running of the “Race to the Clouds” in Colorado Springs, Colorado. Entries with Porsche connections – including one factory driver – will challenge for fastest time honors in four different divisions and classes. While not running a Zuffenhausen-built car in 2018, Porsche “works” driver Romain Dumas (France) will be attempting his fourth – third consecutive – win at Pikes Peak. The defending champion will challenge for outright victory as well as attempt to set a new track record with an all-electric race car produced by Porsche parent company Volkswagen. Dumas’ previous wins came in 2014, 2016 and 2017. The Frenchman – who raced in the LMGTE-Pro class this past weekend in the No. 94 Porsche GT Team Porsche 911 RSR at the 24 Hours of Le Mans – is behind the wheel of the No. 94 Volkswagen I.D.R Pikes Peak in the Unlimited Division. Porsche veteran David Donohue (West Chester, Pennsylvania) will make his second appearance at Pikes Peak this weekend. The 2009 Rolex 24 At Daytona overall winner (driving a Brumos Racing-prepared Porsche Daytona Prototype) broke the ten-minute barrier in his debut last year with a run of nine-minutes, 49.954-seconds. The Client Relationship Manager for Porsche Cars North America brings a current generation Porsche 911 GT3 R, numbered 911, to the hunt this year for Time Attack 1 Division honors. Two additional Porsche customer entries will challenge Donohue: Akio Kobayashi (Japan) in the No. 249 Porsche 911 GT3 and local Colorado Springs ace Fred Veitch in his No. 73 Porsche 911 Turbo (type 996). The four remaining cars carrying the Porsche badge in the 2018 Pikes Peak field all are in the Pikes Peak Challenge Class – Pike Peak Open Division. Raphael Astier of France will pilot the No. 30 Porsche 911 GT3 RS (model year 2007) up “America’s Mountain”. Laure Many, also of France, made her Pikes Peak rookie start in 2017, she is back in a classic 1978 Porsche 911 SC. Attempting to better the two French patriots in the class are two Colorado-residents. The No. 25 911 GT3 Cup car (model year 2014) will be driven by veteran Robert Prilika of Larkspur. The final Porsche is an inevitable fan favorite: a 1970 Porsche 914 driven by local Chris Strauch.